When Conan O’Brien left NBC, the split was well-publicized: Jay Leno suddenly wanted his spot back on The Tonight Show, and Gen-X hero O’Brien was shown the door by NBC brass. 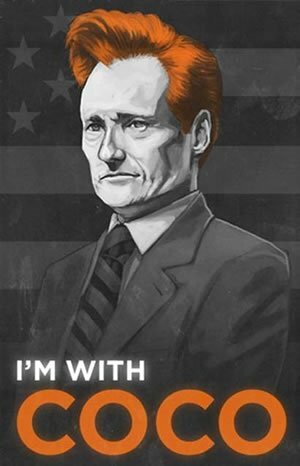 Almost immediately, the Social Media echo chamber went into pro-Conan mode, birthing the #TeamCoco hashtag and some great iconic images. For a while, O’Brien was the white-hot, coolest topic in social media. He became ubiquitous in status updates, @-replies, Flickr streams and YouTube favorites – the kind of penetration that marketers dream about. His services as a late night television host were quite in demand, and surprisingly, it was TBS who won over the rights to Team Coco. From the interaction with O’Brien & his staff at the TeamCoco blog, to user-generated content on Twitter, Facebook and YouTube, TBS has done everything right in promoting their new star. In a CNN article from January 2010 about the Team Coco social media explosion, Josh Bernoff, senior vice president at Forrester Research wasn’t very optimistic about O’Brien’s staying power. But the peak had yet to come. With over a million followers on both Twitter and Facebook,con O’Brien and his new media team have managed to not only sustain the buzz from O’Brien’s early forays into social media, but expand upon them by interaction with his universe of fans across the social media spectrum. Klout has some interesting statistics on O’Brien’s Twitter account – definitely worth checking out if you want to see just how influential he has become in an extremely short amount of time. O’Brien’s foray into social media may have been somewhat thrust upon him in a very special case and short time period, but ha has more than embraced social media as a channel for his humor and promoting his continued projects. He first started tweeting after the incident at NBC because he has no other option. He was legally not allowed to perform on radio, TV, or the internet. So Twitter was his chance to continue his act, so to speak. To reach out to the fans that were supporting him. His Twitter account blew up overnight and O’Brien continued to see the power of social media work for him. O’Brien as experimenting with on the Twitter platform right from the start by choosing to follow only one random stranger and see what would happen. He then started to plan a comedy tour, which he was allowed to do. O’Brien’s cross country comedy tour did not spend one penny on advertising. Instead O’Brien sent out one tweet pointing to the website where people could buy tickets and all cities sold old in a couple hours. O’Brian has of course continued embracing social media along his tour, even assigning a new hashtag for each city. Will The New Show Be Social? TBS seems to be on board. They featured Twitter in a Variety ad they bought for O’Brien to try and help score him an Emmy. The network supporting his social media credibility is a great sign. O’Brien’s new show kicks off in November. And while O’Brien has kept toying with social media, we wonder what we will see when the TV show takes over this Fall. Will O’Brien keep the show going on Facebook and Twitter? Will he respond to people online using these tools? Or is Twitter just a stop gap so he can keep the comic juices flowing until he is back on the air? Jimmy Fallon launched his late night show with YouTube, Twitter, and his blog playing a big roll. 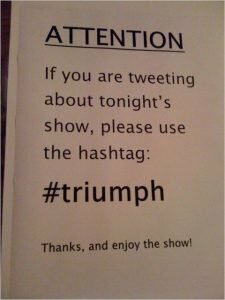 He continues to use social media actively as part of the show. We hope O’Brien does more of the same. How would you like to see O’Brien incorporate social media into his new show?